It doesn't close because the previous owner stuck some wood in the latch, and there doesn't seem to be any place for the lock. I'd like to replace this, but I'm not sure if it will be possible. The screws on the face plate are painted over, and it seems to be pretty far in there, and the strike plate is totally painted over. Will it be possible to replace this with a more modern door handle? Any ideas? Thanks! The paint's no problem. Cut around the door knob escutcheon with a sharp utility knife, so it doesn't rip chunks of paint off the door. Do this anywhere there's paint-glue holding in metal parts. Scrape the paint out of the groves in the tips of the flat head screws using a screwdriver or the knife if you have to. How do I replace mortise locks with bored cylindrical locks? That post says don't. Replace it with another mortise lock. Other posts mention having a hard time finding a match for their hardware, you might want to see if you can get yours working again. You can score the paint with a knife edge or screwdriver corner, then chip/dig the excess paint away, to free things up. The thing below the knob, before it was painted in place, is the keyhole cover. It's supposed to swivel to the side. This is almost certainly a bit key lock with just a few levers; a good locksmith could get it all working again and give you an appropriate key if you want to maintain the history. For security you might want to mount a deadbolt higher on the door, with a modern cylinder and key. If you want to replace this old mortise lock set, there are a few choices. It's going yo be hard but not impossible to fit a modern mortise lockset into the mortise cavity. 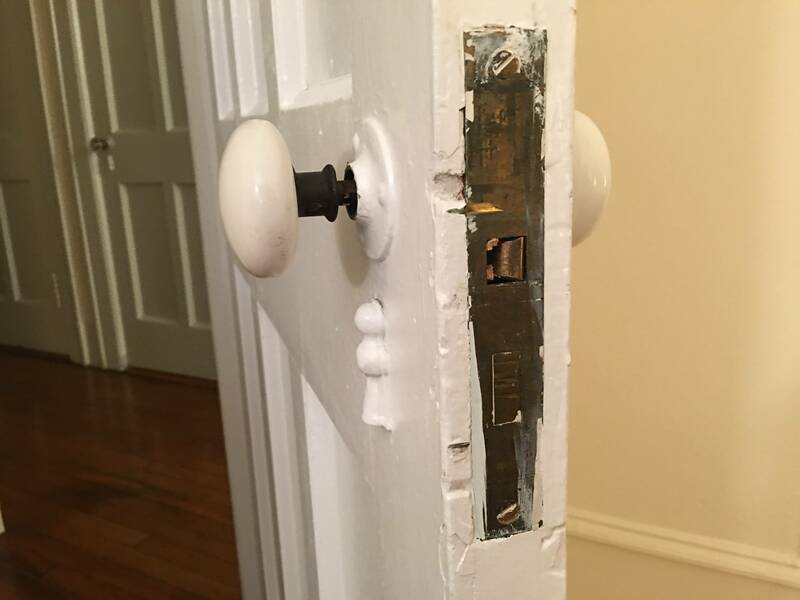 Or you could fill the mortise by gluing in one or more appropriately sized blocks of wood, drill the repaired door, and mount a tubular-style knobset, which is the type most commonly used today, optionally mounting a deadbolt over it. Or you could retire and replace this door. Unless you really want a new door latch these type of locks can be rebuilt by a lock smith, perhaps much cheaper than hiring a carpenter to fill the door in to install a standard modern knob, off the shelf of the local hardware store. Mortise locks are still made and there may be a chance to find one that will replace the original, but that will take research. Here is a latch set that may come close to an outright replacement, but more would need to be known about your door that the picture does not show to know for sure. Possible?, yes. Might it be hard work?, also yes. Painted over is a solvable problem, but it will involve getting the paint out of the slots of the screws, and cutting or breaking the paint film sticking the wood to the metal. Paint can be removed, so do that. If you remove the door you may be able to have someone less daunted by it work on it in their shop, rather than calling them out to your house to deal with it. If you wrote appearing more daunted than you actually are, then start scraping paint out of the screw slots, and use a good screwdriver that fits the slots well to remove the screws. Getting that lock out, keyed, and replaced may be a lot of trouble, maybe you could just install a surface deadbolt (under $20) instead? They are not real secure but sounds like it would be good enough in this situation. Not the answer you're looking for? Browse other questions tagged doors or ask your own question. Where can I find a key for my old locks? Why doesn't my freshly painted door fit back in the frame?